This is an artists rendering for the proposed residential/commercial building. Brian Harrington, a planner for the City of Bend, told the Source the developer's infrastructure plans are nearly approved with the engineering department and the building permits are currently in review by the building division. 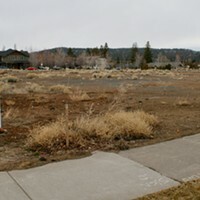 deChase Miksis Development, a Eugene firm, is handling the development on behalf of the owner, Forum Westside LLC, which is also based in Eugene, according to documents from the City of Bend. City records show the architect for the project is Portland-based BLRB Architects, which designed Newport Landing, a 40-unit single family and detached dwelling building on Bend's westside. The firm also designed the 25 luxury townhomes near the Old Mill District called the Mill Quarter and helped renovate the 100 Wall Building downtown. According to the proposal on file with the City, the 191,064 square foot building will also have three food cart pads. During the public comment period, the City only received five emails, with three in favor of the mixed-used proposal. David Welton wrote that he was in favor of the additional housing and mixed-use commercial the project will bring in a highly walkable part of town. "Housing people in a city with rapidly rising rents, and providing some commercial amenities to boot is, in my book, far more important than the city getting involved with trying to figure out precisely how much parking to force a developer to provide," Welton said in his email. James Roberts, who said he lives in the River West Neighborhood which borders the building, said in his email the project was precisely the type of re-use for the site that he hopes will kick start the redevelopment of the city's central west side. "Sadly, many of my neighbors have argued the long-dispelled axioms of NIMBYs (not in my backyard) and despite explanations of how traffic and parking work in real life they appear to be mostly united in opposition. Thus the reason for my support today. Build this and get the other project in the works and this area can begin a wonderful transformation that will be an asset to the city for decades to come," Roberts wrote in his email. The City also received an email from Steve and Danielle Tee, questioning the building's height and the number of parking spaces and traffic impacts. "We strongly believe that a three-or four-story structure would be more compatible with the development profile of the other uses in the vicinity, such as those constructed on the OSU-Cascades campus," the Tees wrote in their email. "Because we can think of no six-story structures on Bend's west side, we are concerned that approval of the application without modification would be precedent-setting, and lead to an increase in the number of proposals for highly dense and intense mixed-use development in the area without regard to neighborhood compatibility." In February, Linda May and Tracy Wright—both homeowners in River West—told the Source the combination of the apartments now coming to the Old Ray's, and the possibility of apartments next to the Bend Park and Recreation Pavilion were too many, too soon, and they were worried about traffic issues. In regard to parking, the City's code states that vehicle parking is allowed only on approved streets, within garages, carports and other structures, or on driveways or parking lots that have been developed in conformance with the code. City officials found in their assessment of the proposed building that the parking conforms to the code, and the proposed shared parking exceeds the minimum requirement by 19 spaces. In regard to traffic, the City sometimes requires a transportation impact analysis under the Bend Development Charter for certain types of development proposals, to determine access restrictions of driveways onto arterial and collector roadways. The City's finding was that the Transportation Facilities Report that deChase Miksis submitted on Jan. 5, 2018—prepared by Transight Consulting LLC—indicated the proposed development will result in a decrease of 30 to 60 percent of traffic from the site's previous use as a grocery store. Therefore, the City concluded a TIA is not required for the proposal. It's unclear what type of dwellings the developers are going to build. Calls to deChase Miksis asking about what type of living spaces—high-end apartments, affordable housing or luxury townhomes—were not returned.